We have reached part seventeen of Sports Enthusiasts’ 2015 College Football Preview. The Pac-12 South is on tap to be previewed as well as the Pac-12 Championship Game. The Previews will close out next week with the SEC. The entire schedule is below. Let’s delve into the tough Pac-12 South Division. 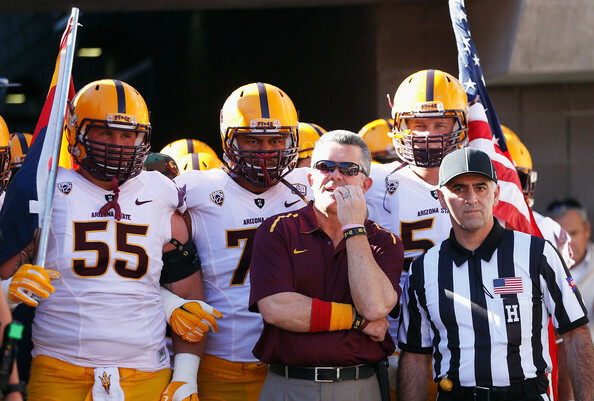 Todd Graham came in for the 2012 season and immediately made the offense better and also improved the defense. They went from 6-7 in 2011 to 8-5 in 2012. 2013 was even better when the Sun Devils went 10-4, but lost the Pac-12 Title Game, as well as Holiday Bowl. 2014 was another double digit win season with ASU going 10-3 thanks to a 36-31 win over Duke in the Sun Bowl. 2015 represents Graham’s most starters returning with 16 (previous high was 15 in 2013). The offense will have seven starters back from a unit hat produced 36.9 points and 442 yards per game. Taylor Kelly is gone after an injury filled season, which saw Mike Bercovici play at quarterback. Bercovici threw for 1,445 yards with 12 touchdowns and 4 interceptions while returning this year to lead the offense. DJ Foster ran for 1,081 yards and 9 touchdowns, but has been moved to wide receiver while Demario Richard had 478 yards rushing and 4 touchdowns. Jaelen Strong was the top receiver last year with 1,165 yards and 10 touchdowns, but has moved on to the NFL. Foster was the second leading receiver with 62 catches for 688 yards and 3 touchdowns and should be one of the top receivers again in 2015 with the full-time move to the position. Also in the fold are Cameron Smith (41 catches for 596 yards and 6 touchdowns), Gary Chambers (10 catches for 204 yards and 2 touchdowns), Kody Kohl (16 catches for 167 yards and 4 touchdowns), and Ellis Jefferson (11 catches for 144 yards and 2 touchdowns). Three starters are back on the offensive line as well. While the loss of Strong hurts, there is plenty of talent and experience on the team to see the offense have a chance to be even more productive. The defense has nine starters back, which is a vast improvement over last year. In 2014, the defense had only two starters returning and still gave up 27.9 points and 417 yards per game. Three starters are back on the defensive line led by Edmond Boateng (22 tackles and 2.5 sacks) and Tashon Smallwood (23 tackles and 2 sacks). The linebackers have two starters returning led by Salamo Fiso (83 tackles, 3.5 sacks, and 7.5 tackles for loss) and Antonio Longino (94 tackles, 2 sacks, and 3.5 tackles for loss). The secondary has three starters back led by Jordan Simone, who had 100 tackles (#2 on team), 1 sack, 3.5 tackles for loss, and 2 interceptions. The defense will probably be the key for ASU in 2015 if they are to contend for the Pac-12 title and they have an excellent chance at being even better than they were in 2014. Arizona State opens the year in Houston, Texas to face Texas A&M. The final two non-conference games are at home against Cal Poly and New Mexico. In division, they face USC, Colorado, and Arizona at home while playing UCLA and Utah on the road. From the North, ASU has Oregon (home), Washington State (road), Washington (home), and California (road). The offense will be good enough for ASU to probably win most of their conference games and could set up a rematch of the Oregon game in the Pac-12 Championship Game. UCLA will be entering 2015 with Jim Mora in his fourth season. UCLA went 9-5 in year one during 2012 including a three point loss to Stanford in the Pac-12 Title Game. 2013 and 2014 produced identical 10-3 records with bowl victories each year. 2015 sees Mora have his most experienced team with 18 starters, which makes them a very dangerous team this year. The offense for UCLA has 10 starters returning, but quarterback Brett Hundley (3,155 yards passing with 22 touchdowns and 5 interceptions; 644 yards rushing and 10 touchdowns) departs. The trio of Josh Rosen, Jerry Neuheisel, and Asiantii Woulard will be battling to replace Hundley. The good news is the rest of the offense returns led by Paul Perkins at running back. Perkins ran for 1,575 yards and 9 touchdowns while also grabbing 26 catches for 201 yards and 2 touchdowns. The top five receivers all return led by Jordan Payton (67 catches for 954 yards and 7 touchdowns), Thomas Duarte (28 catches for 540 yards and 4 touchdowns), and Devin Fuller (59 catches for 447 yards and a touchdown). The entire offensive line returns as well. 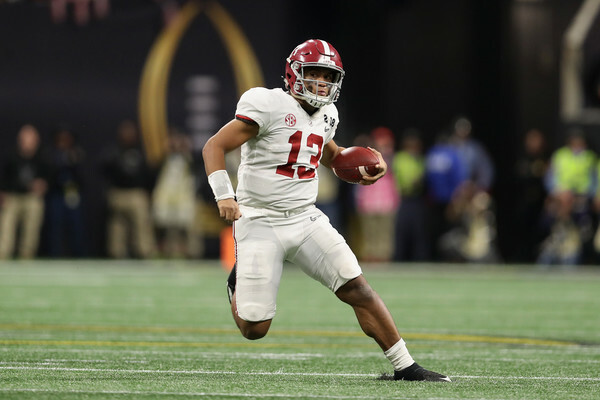 After putting up 33.4 points and 468 yards per game in 2014, the offense could reach those numbers again, but will need the quarterback to play very well right out of the gate. The defense has eight starters back in 2015, just like they did last year. The 2014 version allowed 28.1 points and 399 yards per game. Two starters are back on the defensive line in Kenny Clark (58 tackles and 5.5 tackles for loss) and Eddie Vanderdoes (50 tackles, 2 sacks, 3.5 tackles for loss). At linebacker, two starters return including the versatile Myles Jack. Jack was second on the team with 88 tackles, but also had 8 tackles for loss, 7 pass breakups, and an interception (also had 113 yards rushing and 3 touchdowns). Also returning is Deon Hollins, who had 31 tackles, 9 sacks, and 2 pass breakups. The secondary has all four starters back after allowing 251 yards passing and 61.6% completions. Priest Willis (22 tackles), Fabian Moreau (53 tackles, 3 tackles for loss, and 8 pass breakups), Jaleel Wadood (59 tackles), and Randall Goforth (2013 starter with 78 tackles and 3 interceptions) will be in the secondary. After performing worse than expected in 2014, the defense should bounce back and could produce the best defense yet under Mora (2013 with 23.2 points and 386 yards per game allowed). UCLA welcomes Virginia to LA before a road trip to UNLV in week two. Their final non-conference game is at home against BYU. Within the South division, UCLA faces Arizona, Utah, and USC on the road. At home, they will take on Arizona State and Colorado. From the North, UCLA draws Stanford (road), California (home), Oregon State (road), and Washington State (home). The games against Arizona State (10/3) and USC (11/28) are sure to decide if they make the Pac-12 Championship Game, which they definitely can. USC was crushed by NCAA sanctions in Lane Kiffin’s first two years, but they still managed to go 18-7 those two seasons including a 10-2 record in 2011. In 2012, they slumped to 7-6 after being considered as one of the top teams that year and Kiffin’s time ended in 2013 after the Arizona State game when they were 3-2. They finished the year 10-4 before hiring Steve Sarkisian prior to the 2014 season. Sarkisian went 9-4 in year one and the expectations are high for his second season in charge. On offense, USC will have seven starters returning from a group that put up 35.8 points and 458 yards per game. Cody Kessler looked comfortable in the system throwing for 3,826 yards with 39 touchdowns and 5 interceptions. He loses three of his top five receivers including Nelson Agholor, who had 104 catches for 1,313 yards and 12 touchdowns. Juju Smith-Schuster is back to take one of the starting spots again after grabbing 54 passes for 724 yards and 5 touchdowns. Darreus Rogers had 21 catches for 245 yards and 4 touchdowns while Jalen Cope-Fitzpatrick, Steven Mitchell, and Adoree’ Jackson could make an impact in the passing game. The rushing game took a hit with Javorius “Buck” Allen leaving after rushing for 1,489 yards and 11 touchdowns in 2014. Justin Davis (595 yards and 4 touchdowns), James Toland (102 yards), and Tre Madden (703 yards in 2013) are all expected to see action. The offensive line returns intact as well to help make holes for the rushing game and protect Kessler. The offense loses some big players at running back and wide receiver, but they could match last year’s numbers in year two of Sarkisian’s schemes. The defense has seven starters back in 2015 after allowing 25.2 points and 408 yards per game. The two linemen returning are Antwaun Woods (37 tackles and 1 sack) and Delvon Simmons (4 tackles and 1 sack). Two linebackers also return in Anthony Sarao (74 tackles, 1 sack, and 2 interceptions) and Su’a Cravens (68 tackles, 5 sacks, 12 tackles for loss, 9 pass breakups, and 3 interceptions). The secondary has three starters back including two-way play Adoree’ Jackson (49 tackles and 10 pass breakups), Kevon Seymour (49 tackles and 13 pass breakups), and Leon McQuay (36 tackles, 4 pass breakups, and 2 interceptions). The defense should improve in 2015 with the new schemes under their belt and more depth as well. USC opens with Arkansas State and Idaho at home the first two weeks before completing their non-conference slate on October 17 against Notre Dame on the road. Within their division, USC will face Arizona State and Colorado on the road while taking on Utah, Arizona, and UCLA at home. From the North, USC has to play Stanford (home), Washington (home), California (road), and Oregon (road). The talent is there for USC to win the division, but facing the top three from the North makes it harder for them to do it. However, do not count them out in year two under Steve Sarkisian. Rich Rodriguez did not have a good time at Michigan going 15-22 with two losing seasons. After a year off in 2011, Rich Rod came back to coaching by taking over at Arizona, which was coming off a 4-8 record. Rich Rod has done well in his three years going 8-5 in both 2012 and 2013 while upping the record to 10-4 in 2014 with a Pac-12 Title Game appearance (lost 51-13 to Oregon). Offense has not been an issue for Arizona in Rodriguez’s tenure. Last year, the offense put up 34.5 points and 464 yards per game and seven starters return from that group. Quarterback Anu Solomon threw for 3,793 yards with 28 touchdowns and 9 interceptions while also rushing for 291 yards and 2 touchdowns. He will be back along with last year’s top rusher in Nick Wilson, who had 1,375 yards and 16 touchdowns. The top receivers are back for Arizona with Cayleb Jones catching 73 passes for 1,019 yards and 9 touchdowns last year. The other is Samajie Grant, who had 45 catches for 718 yards and 6 touchdowns. The offensive line has only two starters back, but does have some transfers coming in. The offense has a great chance to produce higher numbers than the last two years. The defense has not been bad under Rodriguez the last two years. In 2013, the defense allowed 24.2 points and 401 yards per game, but that was due to all 11 starters returning. Last year, the defense gave up 28.2 points and 451 yards per game with six starters back. That same number returns this year including the electric Scooby Wright at linebacker. He was named 1st Team All-American last year after recording 163 tackles, 14 sacks, and 15 tackles for loss! He will be joined by Derrick Turituri at linebacker after he had 44 tackles, 3 sacks, and 2 tackles for loss. On the line, three starters return led by Reggie Gilbert, who had 49 tackles, 3 sacks, and 2.5 tackles for loss. The other two starters will be joined by junior college transfers to give them solid depth on the line. The secondary has two starters back in William Parks (81 tackles, 1 sack, 12 tackles for loss, 8 pass breakups, and 2 interceptions) and Jarvis McCall (49 tackles and 7 pass breakups). The defense will probably have similar numbers to last year. Arizona’s non-conference schedule consists of Texas-San Antonio (home), Nevada (road), and Northern Arizona (home). From the South, Arizona will have to play UCLA and Utah at home while going on the road to face Colorado, USC, and Arizona State. From the North, Arizona has to play Stanford (road), Oregon State (home), Washington State (home), and Washington (road). Arizona should be back in a bowl game in 2015 and could make some noise with an upset or two in the Pac-12. Kyle Wittingham has been the head coach at Utah since 2005. In that time, Utah has 85-43 with only two losing seasons and also transitioned from the Mountain West to Pac-12. The Utes went 8-5 in year one of their Pac-12 career in 2011, but dropped to 5-7 the next two seasons. 2014 was a much improved effort with Utah going 5-4 in conference and 9-4 overall. Despite that 5-4 record in conference, Utah still finished fifth in the South Division, but they were very good last season. There will be seven starters back on offense from a group that put up 31.3 points and 388 yards per game. Travis Wilson threw for 2,170 yards with 18 touchdowns and 5 interceptions, but may find himself in a battle with Kendal Thompson (324 yards with 2 touchdowns and 2 interceptions). Devontae Booker is returning at running back as well after he ran for 1,512 yards and 10 touchdowns last year. Booker is also the second leading receiver that is coming back after grabbing 43 passes for 306 yards and 2 touchdowns. The top receiver this year will be Kenneth Scott, who had 48 catches for 506 yards and 4 touchdowns. The Utes did lose three of their top four receivers from 2014. The offensive line has four starters back and the offense will probably do well no matter who is at quarterback. The defense will have seven starters returning after allowing 24.9 points and 393 yards per game in 2014. The line will have three starters back in Hunter Dimick (52 tackles, 10 sacks, and 4.5 tackles for loss), Lowell Lotulelei (33 tackles and 4 sacks), and Jason Fanaika (55 tackles, 5 sacks, and 4.5 tackles for loss). Also in the mix on the line will be UCLA transfer Kyle Fitts. Two are returning at linebacker led by Jared Norris, who had 116 tackles, 4 sacks, and 9 tackles for loss. The secondary has Dominique Hatfield (38 tackles, 9 pass breakups, and an interception), Marcus Williams (59 tackles), and Gionni Paul (51 tackles and 4 interceptions) back. The defense will be solid again in 2015. Utah will have an interesting non-conference schedule to set them up for Pac-12 play. They will face both Michigan and Utah State at home before a road game at Fresno State. From their division, Utah will face Arizona State, UCLA, and Colorado at home while playing USC and Arizona on the road. From the North, Utah has to play Oregon (road), California (home), Oregon State (home), and Washington (road). While it is hard to pick Utah fifth with a solid team, someone has to be put here. However, Utah is capable of pulling upsets (see UCLA and USC in 2014 and Stanford in 2013). Utah should not have trouble making a bowl game in 2015 and could make some noise in this tough Pac-12 South. It has been a rough decade for Colorado. They have not had a winning season since 2005 and only one bowl appearance in that time (2007 loss to Alabama 30-24). The Buffaloes entered the Pac-12 in 2011 with Jon Embree at the helm, but he struggled mightily with his final record being 4-21 in those two years. Mike MacIntyre was hired for the 2013 season and the Buffaloes won four games in 2013 to go 4-8 before falling to 2-10 last year. There are some positives for Colorado going forward in MacIntyre’s third year. The offense for Colorado put up only 17.8 points and 303 yards per game in 2012. With the coaching change, those numbers increased to 25.4 points and 370 yards per game in 2013 before going even higher in 2014. There will be seven starters back from last year’s group that put up 28.5 points and 439 yards per game. Quarterback Sefo Liufau threw for 3,200 yards with 28 touchdowns and 15 interceptions. Three of the top four running backs return, but their output was poor last year. Christian Powell (448 yards and 4 touchdowns), Michael Adkins (398 yards and 3 touchdowns), and Phillip Lindsay (391 yards) will all be back as they look to increase production. The top two receivers return in Nelson Spruce (106 catches for 1,198 yards and 12 touchdowns) and Shay Fields (50 catches for 486 yards and 4 touchdowns). The offensive line has four starters back while the offense as a whole should be able to improve on last year’s numbers. The defense has been the issue the last four seasons. In 2012, they gave up 46 points and 489 yards per game while those numbers went down to 38.3 points and 468 yards per game in 2013. 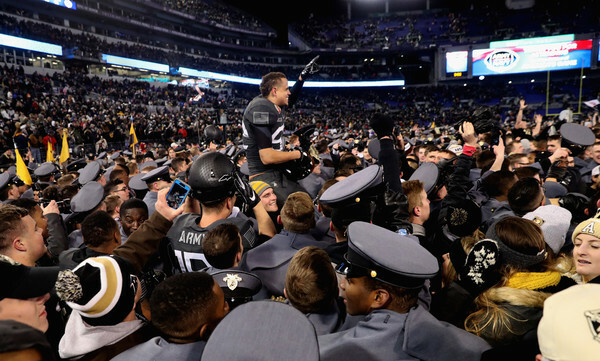 2014 was about the same with the defense surrendering 39 points and 461 yards per game. There will be nine starters back from that defense, which may or may not be a good thing. The defensive line has three starters back in Derek McCartney (24 tackles, 4.5 sacks, and 2 tackles for loss), Josh Tupou (28 tackles, 2 sacks, and 2 tackles for loss), and Jimmie Gilbert (27 tackles, 2.5 sacks, and 2.5 tackles for loss). The linebackers all return led by Kenneth Olugbode (70 tackles), Addison Gillam (64 tackles, 3.5 sacks, and 3.5 tackles for loss), and Chidobe Awuzie (62 tackles). The secondary has three starters back led by Tedric Thompson, who had 56 tackles and 3 interceptions last year. The defense should improve in 2015 with depth and experience both going upward. Colorado begins the year on the road at Hawaii, which will allow them to have four non-conference games. They finish up the non-conference slate within the state of Colorado against Massachusetts (home), Colorado State (in Denver), and Nicholls State (home). In their division, Colorado has to face Arizona State, UCLA, and Utah on the road while playing Arizona and USC at home. From the North, Colorado has the quartet of Oregon (home), Oregon State (road), Stanford (home), and Washington State (road). It will be another rough year for Colorado in terms of their record, but they will be making strides this year to set them up for the next few seasons. The Pac-12 South is very deep in terms of talent and experience, which made it hard to predict. Arizona State, UCLA, and USC seem to be the trio that stands out, but counting out Arizona and Utah would be a mistake. Colorado is clearly the worst team in the division and they will more than likely be back in the cellar this year. Below is the predicted order of finish for the Pac-12 South. We predicted that Oregon would win the Pac-12 North and that will set up a Championship Game between them and Arizona State. That would be a wonderful game to see with plenty of offense on the field. We will call Oregon to win by a field goal if they were to meet and have a chance at making the College Football Playoff again. 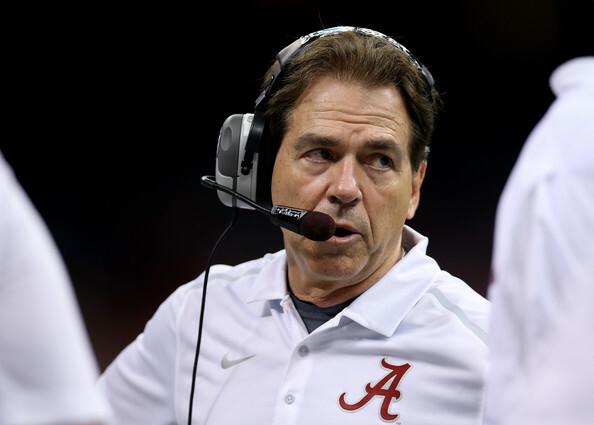 Next week will wrap up our 2015 College Football Preview with the Southeastern Conference. Be sure to check that out on Tuesday (East) and Friday (West), respectively.